“Sphinx” is a very special movie. The Story takes place in one of the most hypnotic, beautiful and mysterious place in the World : “Egypt”. This film is one of the most exotic romance and thrilled movie that I have ever seen. It is both a tale of an ancient and modern adventure which merges actual facts and old curses (the mystic of the king Tut legend and the search of a lost tomb of the Pharaoh Seti I). Many times, Egypt was taken by screenwriters as the theater of many great adventures but in the case of “Sphinx”, the moviemakers choose to speak about the secret black market of antiquities. 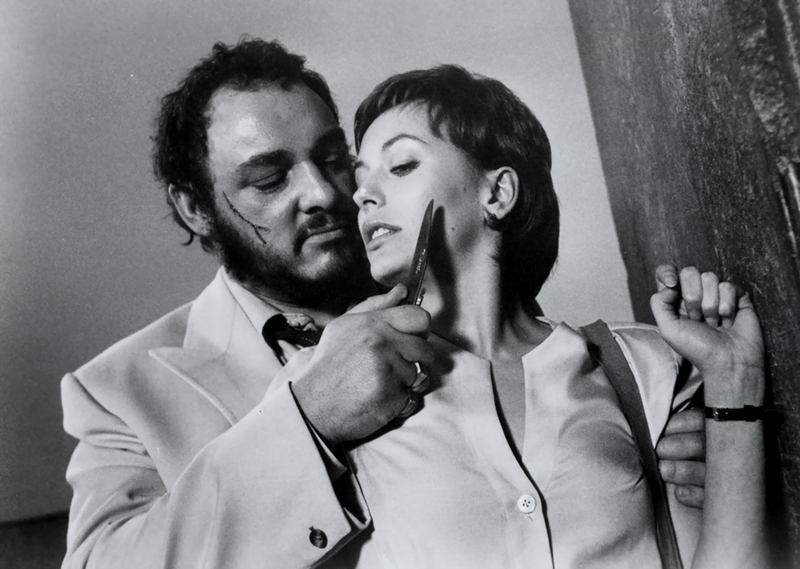 It is why to me, “Sphinx” is a very audacious movie. The Story : A young brilliant Egyptologist Erica Baron (Lesley-Anne Down) is researching some information about a forgotten ancient architect of the Pharaoh Seti I, named Menephta. 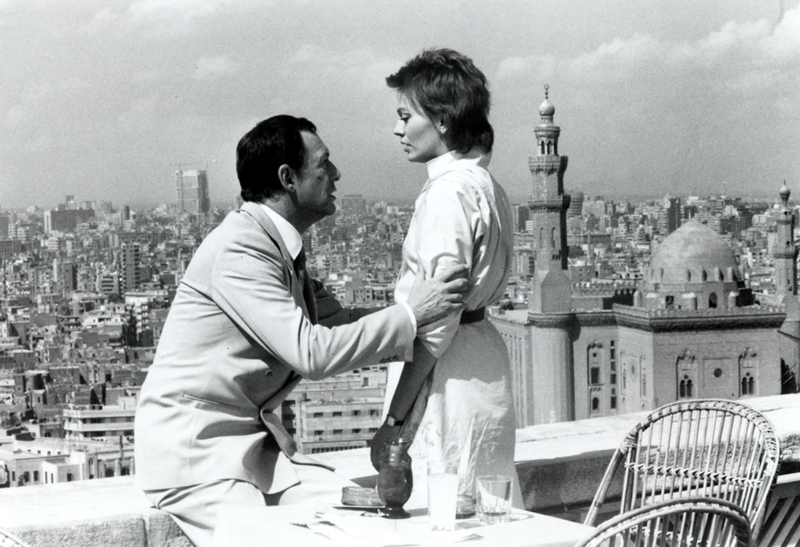 After her arrival in Cairo, she is shown a golden statue by an old unscrupulous art dealer-shopkeeper, Abdu-Hamdi (Sir John Gielgud) who is brutally murdered. 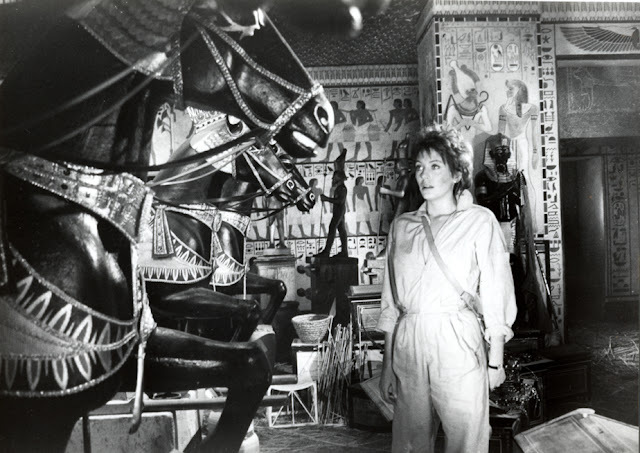 A French journalist, Yvon Julien de Margeau (Maurice Ronet) saves her from the murderers and tries to help her to find the stolen statue of the Pharaoh Seti I. Thus, she becomes the target of the black marketeers determined to keep their treasure for themselves. 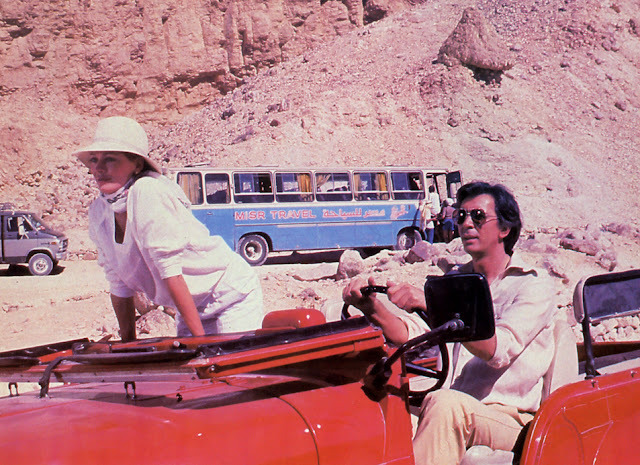 Only, the handsome Director of Antiquities for UNESCO, Ahmed Khazzan (Frank Langella), tries to protect her from all the dangers around and falls in love with Erica. In 1980, Orion Pictures bought the rights of the Robin Cook’s best–selling novel “Sphinx” (600 000 copies in hard cover). He was also known like the successful novelist of “Coma” which a film adaptation was made by Michael Crichton in 1978. The Academy Award-winning director, Franklin J. Schaffner, (“Planet of the Apes” (1968), “Patton” (1970), “Papillon” (1973) and “The Boys from Brazil” (1978)) was approached to do it for the screen. With the collaboration of the producer Stanley O’Toole (“The Boys from Brazil” (1978)), he entrusted the screenwriter-director John Byrum (“Heart Beat” (1980), “The Razor Edge” (1984)) with the writing of the screenplay. The veteran American director was so involved in this project that he decided to serve as executive producer and “Sphinx” became a Franklin J. Schaffner film for Orion Picture release through Warner Bros.
Like in the first chapter of the Indiana Jones saga (“Raiders of the lost Ark” / 1981), the main character is again an archeologist but this time in a realistic way. 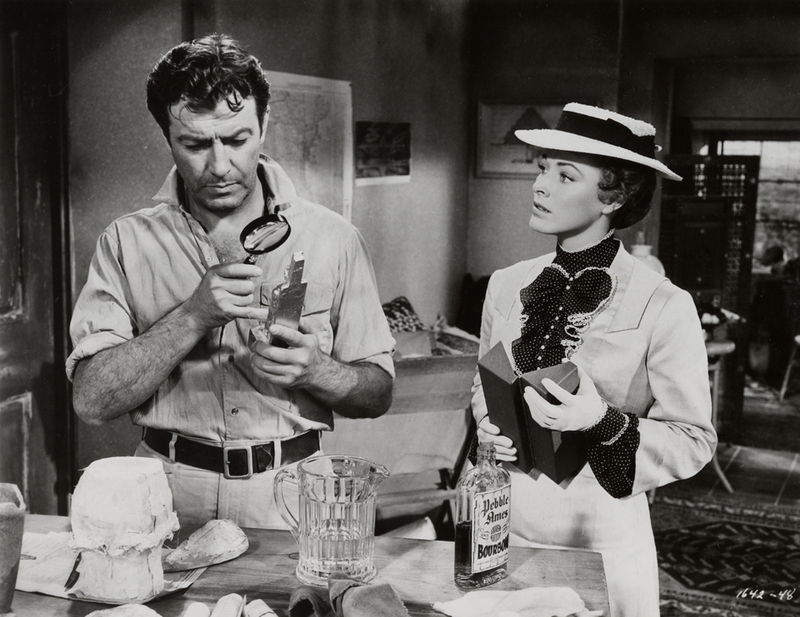 Some years before, the legendary actor Robert Taylor portrayed an intrepid Egyptologist in the “Valley of the Kings” (1954), now, it is the very talented and gorgeous British origin actress Lesley-Anne Down who protrayed the leading part of Erica Baron who fought against a bunch of vicious black marketeers. It was her fourth major role for the screen after “The (First) Great Train Robbery” (1978/ See the topic), “Hanover Street” (1979) and “Rough Cut” (1980). The very talented American stage and film actor Frank Langella (“Dracula” (1979), “1492 : Conquest of Paradise” (1992) , “Dave” (1993), “The Ninth Gate” (1999), “Frost/Nixon” (2008) and “Robot and Frank” (2012)) joined her to portray the handsome and intellectual Ahmed Khazzan, who headed the antiquities division of the United Nations. The high class Shakespearean British actor, Sir Arthur John Gielgud (“Julius Caesar” (1953), “Richard III” (1955), “The Charge of the Light Brigade” (1968), “Providence” (1976) and “Hamlet” (1996)) played the part of the mysterious Egyptian shopkeeper, Abdu Hamdi. The French legendary actor-director-writer Maurice Ronet portrayed the now-good, now-bad journalist, Yvon de Margeau (“Elevator to the Gallows” (1958), “Carve Her Name with Pride” (1958), “The Talented Mr Ripley” (1960), “La Piscine” (1969) and “La Balance” (1982)). Three distinguished actors completed this unconventional cast, John Rhys-Davies (“Raiders of The Lost Ark” (1981), “Victor Victoria” (1982), “Shogun” (1980) and “The Lord of The Ring” (2001 / 2002 / 2003) played Stephanos Markoulis, a malicious Greek antiquity dealer, Martin Benson (“The King and I” (1956), “Exodus” (1960), “Cleopatra” (1963) and “The Sea Wolves” (1980)) was Mohammed, the evil chief of the black marketeers and the Jordanian origin actor, Nadim Sawalha (“The Wind and The Lion” (1975) and “Young Sherlock Holmes” (1985)) was Gamal the loyal assistant of Langella’s character. The cinematographer Ernest Day (“Lawrence of Arabia” (1962), “A Clockwork Orange” (1971) and “Mission Impossible” (1996)), the production designer Terence Marsh (“Doctor Zhivago” (1965), “A bridge too Far” (1977) , “The Hunt for Red October” (1990), “Basic Instinct” (1992) and “The Shawshank Redemption” (1994)) and the Art Director Peter Lamont (“Sleuth” (1972), “The Boys from Brazil” (1978), “Titanic” (1996) and “Casino Royale” (2006)) were hired by the producers. 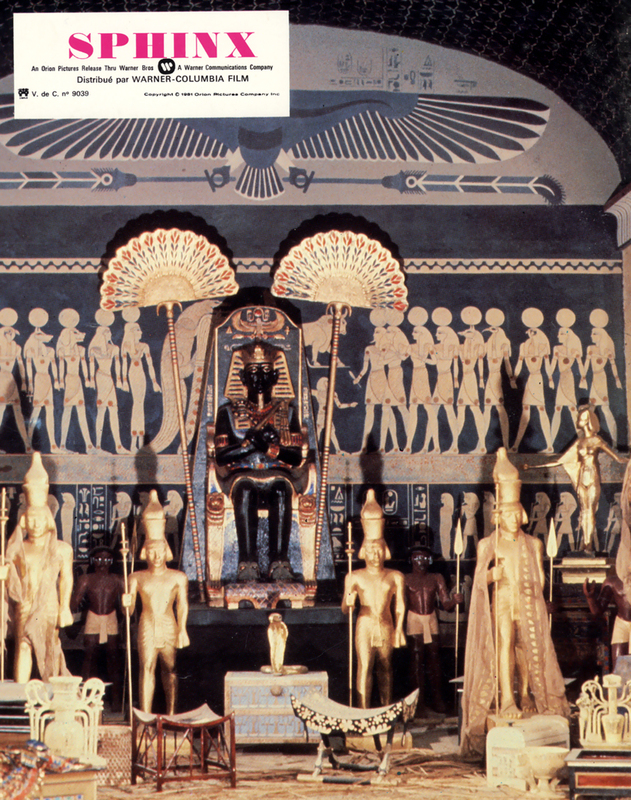 The movie was shot on location in Egypt, Cairo (The Cairo bazaars, the Egyptian National Museum, the Sphinx and Pyramid of Giza), Luxor (the Valley of the Kings and the Winter Palace Hotel) and in Hungary at Mafilm Studios, Budapest for the interiors (the tomb of Seti I with her braces of gold–saddled horses, jeweled thrones, golden warriors, presiding gods and idols, cases of jewelry and true-color hieroglyphics incised on all walls). A one quarter of a mile long tunnel was built in the Hungarian studios to collapse behind the racing Ms Down for the impressive ending of the movie. The brilliant and talented Welsh composer Michael J. Lewis (“Julius Caesar” (1970), “Theater of Blood” (1973), “The Passage” (1979)) was hired to write the musical score. His romantic music is one of my favorite. Like Jerry Goldsmith (“The Wind and The Lion” / 1975) and Maurice Jarre (“The Man Who Would be King” / 1975), Lewis managed to merge ethnic instruments with a large symphonic orchestra. The result was so marvelous that the Director and close friend of Jerry Goldsmith stated of Lewis’ work : “This music could not have done better”. In 1982, the two men will work again together on the very charming comedy with the famous singer Luciano Pavarotti : “Yes Gorgio”. In 1995, the composer produced and conducted several symphonic suites from his best scores (“Sphinx”, “Theater of Blood”, “The Passage”, “Julius Caesar”…) in a spectacular double CD Album : “Orchestral Film Music of Michael J. Lewis - The first twenty-five years (1969/1994)”. Also, a promotional CD Album of the complete score of “Sphinx” was produced by the composer with extra cues. Today, it is difficult to understand why such a versatile composer doesn’t work more for the big screen ? This is a complete mystery to me. Nevertheless, if you want to know more about this great artist you can hear some of his works, on his official website (see the link hereunder) ! 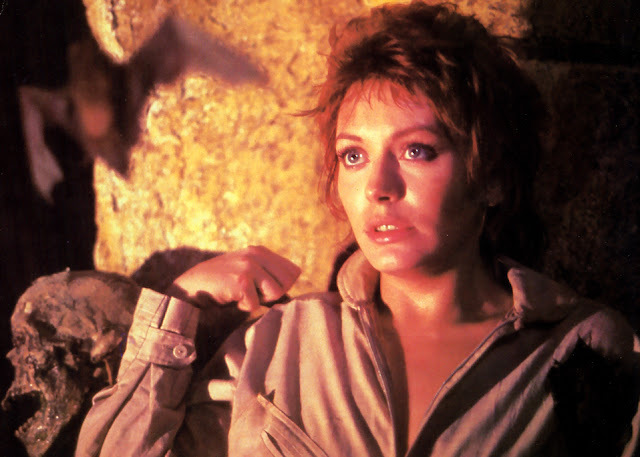 It is well known that the professional conscience obliges everybody to do his best, but in the case of “Sphinx”, we can say that Lesley–Anne Down gave more than a fine performance. In fact, we have the feeling that “she gave her soul” to this movie. Of course, although people can think, she has never opened an archeologist book, we believe in her character. After all, it is the work of an actor to make us believe that he is on the screen. In addition to that, we cannot disregard that the clever direction of the versatile Schaffner probably helped her very much, in finding where she was the best. The elegant Frank Langella was just perfect in his part and his “duo” with Miss Down worked on the screen very well. My only regret is that they didn’t make another movie together. 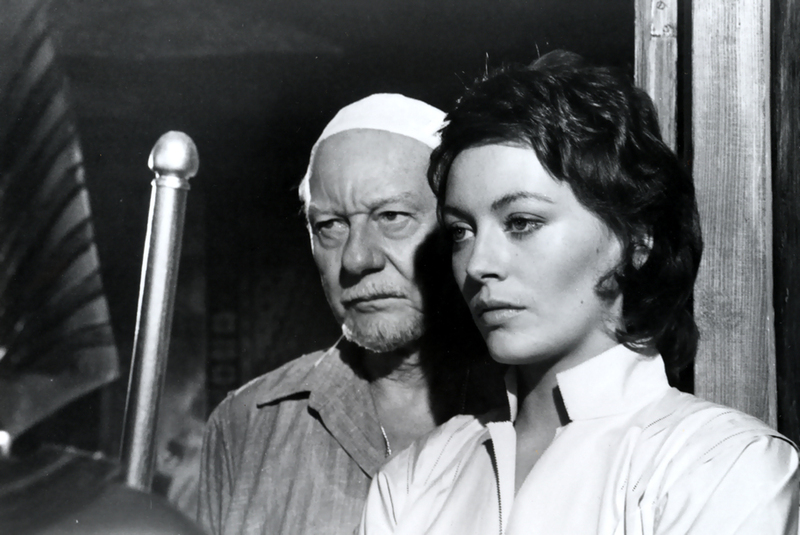 Maurice Ronet and Sir John Gielgud, like always, were very convincing in their parts. Despite the bad response from the critics and audience at that time, I have the feeling that “Sphinx” must be rediscovered and could become a “cult” movie. There are very good moments in this film, especially during the second hour (Erica’s escape from the black marketeers’ trap and the discovery of the golden chambers of Seti I). “Sphinx” by Robin Cook (in English), 1979, Mass Market Place, USA. “Sphinx” by Robin Cook (In French), 1981, J’ai Lu - Edition Illustrée ; N°1219 ; Paris ; France. (This book includes some black & white photos from the movie). “Sphinx”, the US Press Kit (In English), 1981, Orion Picture, US. (This press kit includes photos, movie production information, actors' and actresses' biographies, as well as, synopsis information about the movie…). 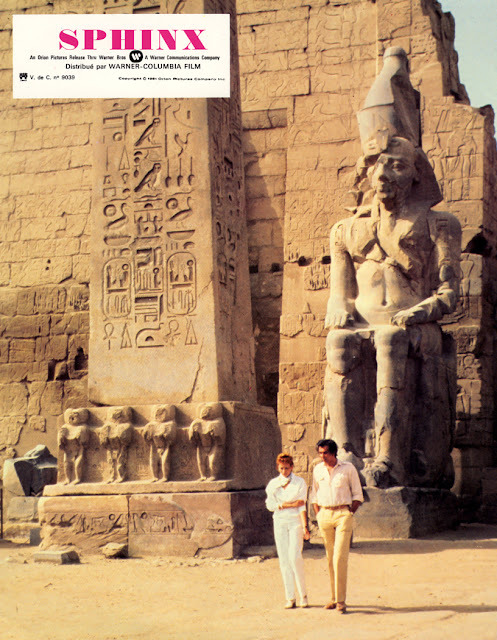 “Sphinx” , the French Press Book (In French), 1981, Warner Bross Inc/Orion Picture Cie, France. (This press book includes some color photos from the movie). 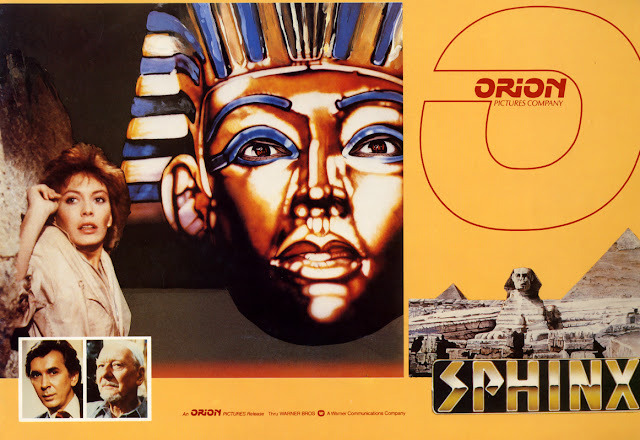 “Sphinx” , the Japanese Program (In Japanese), 1981, Warner Bross Inc/Orion Picture Cie, Japan. (This program includes some black & white and color photos from the movie). A rare Interview of Michael J. Lewis : Soundtrack, Vol. 17 / N°65, March 1998. Ref. N° B003ODIUZ2, Widescreen Edition, NTSC, 16:9 – 177:1. Double CD Album of “Orchestral Film Music of Michael J. Lewis - The first twenty-five years (1969/1994)” by Michael J. Lewis with the Rundfunkorchester Berlin and the Los Angeles Ensemble ; 1995 ; PD 951. (http://www.bluediamondmusic.com/Film%20Music%20CDs.htm).